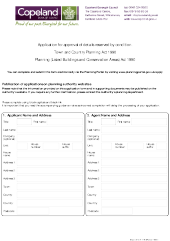 Most planning approvals contain some planning conditions. Conditions are used to ensure that development that may not be considered acceptable, can be approved subject to certain criteria. These criteria are detailed in conditions. Some conditions require you to submit details about particular aspects of the development to the local planning authority and others restrict certain things you can do as part of the development. The approval of details reserved by conditions is also known as 'discharging conditions'. 'Details of the glazing to be used on the ground floor rear window should be submitted to and approved in writing prior to the commencement of the development'. 'The roof of the rear extension hereby approved shall not be used at any time as a roof terrace without the prior approval of xyz'. Any condition that requires the submission of details must be 'discharged' in accordance with the wording of the condition. In most cases this is prior to the commencement of the entire development. Occasionally, some conditions can be discharged prior to the relevant part of the development taking place. Please consult your decision notice for the exact wording of your conditions. In order to discharge a planning condition, you must submit the details, along with a completed application form and the appropriate fee to the planning department. All discharge of conditions incur a fee with the exception of conditions imposed on listed building consents and conservation area consent applications. It may take up to 8 weeks to receive a decision on a discharge of condition application.